Mike Dominie was welcomed by the village board last week as the new electric department superintendent, replacing retiring Marc Staves. Mr. Dominie began his village career as a mechanic for the department of public works. After two years he took a position with the electric department, serving as lineman for about 13 years and as department foreman this past year. Posing with him were Trustees David “Haji” Maroun, Clint Hollingsworth, Marc Staves, Mayor Paul Maroun and Trustee Ron LaScala. Mr. Dominie noted it will be helpful to him to have Mr. Staves assisting the department in the months to come so that the leadership transition will be smooth. Trustee Clint Hollingsworth, who directed the electric department as a board member, had great praise for Marc Staves. “It's been great working with you!” he told him that evening. He said Mr. Staves routinely brought novel ideas and a fresh outlook to the issues before his department and the village in general. 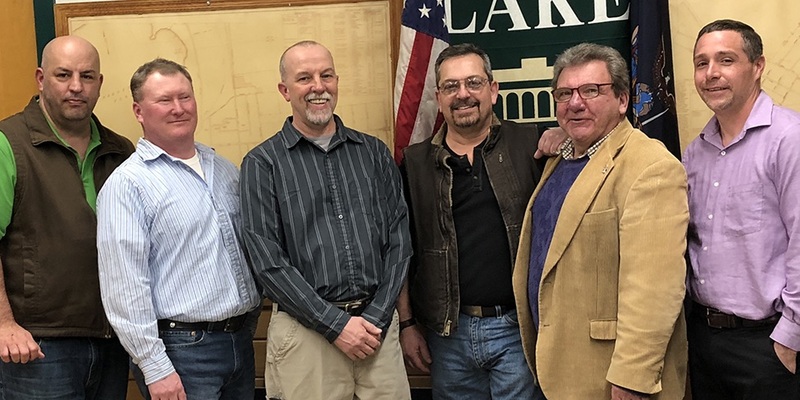 The trustee credited the administrator with the village's new electric car installations, with the preparations for the new department garage and with the various upgrades to the village system over the years. “I always enjoyed going upstairs and talking things over with you, Marc!” the trustee told him. Mr. Staves said he too had enjoyed working closely with the trustee.